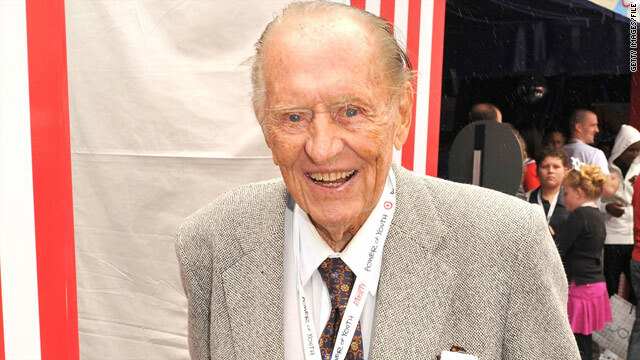 Art Linkletter first rose to fame as a radio announcer before moving to television in 1952. Art Linkletter hosted "House Party" and "People Are Funny"
His 1960 biography was called "Confessions of a Happy Man"
Los Angeles, California (CNN) -- Art Linkletter, the easygoing, smooth-voiced emcee famed for his long-running hosting gigs of the radio and television shows "House Party" and "People Are Funny," and author of "Kids Say the Darndest Things," has died, according to his spokeswoman. Linkletter "died peacefully at home with his family on Wednesday," a statement from the family said. He was 97. "Just one month earlier, while being honored at an event, he was asked what he considered his greatest life accomplishment," the statement said. "He responded 'Family.'" Linkletter rose to fame as a radio announcer in San Diego, later becoming a program director. In 1944, he launched "Art Linkletter's House Party," a daytime CBS radio show that moved to television in 1952 and ran until 1969. "Kids say the darndest things," was Linkletter's often-repeated phrase because of his humorous interviews with children. It became the title of his best-selling book, a country music hit and was reprised by Bill Cosby as a 1998 TV show. The phrase began as a segment on "House Party." Linkletter would ask several children their thoughts on various topics; their responses were often hilariously absurd. "I was Oprah before there was Oprah," he once told The Wall Street Journal. Flowers were placed on Linkletter's star on Hollywood's Walk of Fame Wednesday afternoon. His nighttime show, "People Are Funny," started on radio in 1942 and ran on NBC television from 1954 to 1961. According to Tim Brooks and Earle Marsh's "The Complete Directory to Primetime Network and Cable Shows, 1946-Present," the show featured everyday guests who would be interviewed by Linkletter and then asked to do a stunt. The result for those who failed at the stunt was often a pie in the face or being splashed by water. Linkletter also hosted a short-lived quiz show, "The Art Linkletter Show," in 1963. At its height, Linkletter's fame was notable enough to make him part of Milton Bradley's "Game of Life," which featured Linkletter's endorsement and his photo on the game's $100,000 bill. His 1960 biography was called "Confessions of a Happy Man." But the host's own life was touched by a famous tragedy. In 1969, his daughter Diane -- just 20 at the time -- jumped to her death from a sixth-floor apartment in Hollywood. Linkletter blamed the death on LSD, though the drug use was never confirmed. Linkletter became an ardent anti-drug crusader, releasing a hit record, "We Love You, Call Collect," which won a Grammy Award. Of his five children, two others also predeceased Linkletter: son Robert died in a 1980 auto accident, and another son, Jack, died of lymphoma in 2007. Linkletter is survived by his wife of 75 years, Lois, and two daughters, Dawn Griffin and Sharon Linkletter. Linkletter was born Gordon Arthur Kelly in Moose Jaw, Saskatchewan, on July 17, 1912. Orphaned as an infant, he was adopted by traveling evangelist John Linkletter and his wife, Mary. After a short stint on Wall Street -- he was a typist at an investment bank at the time of the 1929 Crash, he told the WSJ -- he eventually moved to San Diego and attended college at San Diego State University. While in college, he took a job as a staff announcer at CBS affiliate KGB-AM. Linkletter was an astute businessman. The owner of Linkletter Enterprises, he owned millions of acres in Australia and was a sheep and cattle rancher. He also owned oil wells and was a spokesman for several products. CNN's Todd Leopold and Jack Hannah contributed to this report.